Make your own map with your tweets! You can get easily your travel info where you have been. This web service doesn't retrieve protected tweet. Tweet that already saved in this web service will be displayed as public. 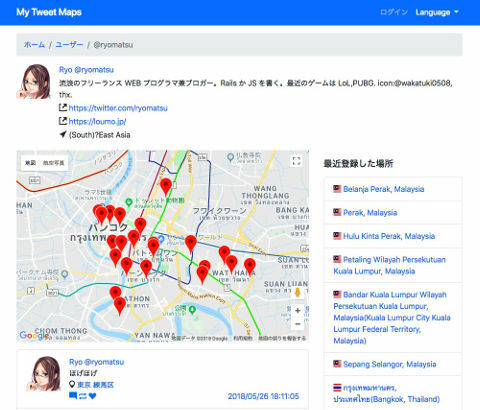 This web service retrieves all of your tweet with place infomation as much as possible. But I can't guarantee that this will work. Your tweets are not deleted when you delete tweets in twitter. Please delete manually. This is beta test now. Specification will be changed without annoucement.